This battery fits all 1990 Mazda Miata and up. 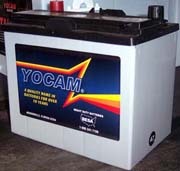 It is a sealed, NO-maintenance AGM battery. Free shipping on the Mazda Miata battery to anywhere in the continental US.